The first teaser trailer for Star Wars: The Last Jedi came out two weeks ago during Star Wars Celebration in Orlando, Florida. Above you can also see the poster for the movie. 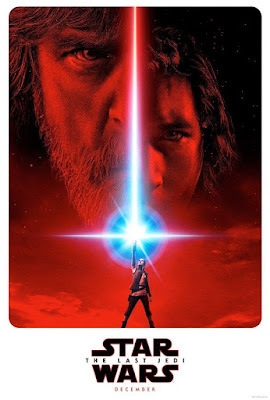 The poster shows Rey holding up her lightsaber and pointing it at the sky, sort of resembling Luke in the classic poster for A New Hope. Notice that the blade is blue, but turns red as it gets higher. I personally think that this means a balance in the Force, both dark and light. One side has Kylo Ren, and the other Luke. This will be a complete analysis and breakthrough of that trailer. The trailer starts out with some ominous music, and Rey places her hand down on a mountain face of Luke's Island on the planet Ach-To. She is panting and looks like she has been through some intense physical training. Then it does a fly-by camera shot of Luke's Island, and shows the sun shining through the mountains. You hear Luke telling Rey, "Breathe..." This is most likely during her Force-training. I think that this location, wherever they filmed it, has some pretty nice scenery. The music is a lot calmer now, and is sounds mystical in a way. Then you see a birds-eye view of the island and Luke saying, "Just breathe... "
Then you see Rey at the side of the mountain, in front of the waves. Then you see Rey's hand on top of a stone ground, and she is using the Force to lift up some pebbles. Luke says, "Now, what do you see?" Rey says, "Light." Then you see Leia on the screen. Rey's theme plays. If you listen closely, you can hear her famous quote of "Help me, Obi-Wan..."
Rey says, "Darkness." You see Kylo Ren's mask in several broken pieces on the floor. Could this mean that he has gotten rid of his mask for a new look? Kylo Ren's ominous theme plays. If you listen closely, you can hear Obi-Wan say, "Seduced by the Dark Side..."
Rey says, "The balance." Then you see a bookshelf with life shining on it. Some have said that this is the Journal of the Willis, an ancient Jedi document about the balance of the Force. Then there is a close-up of the symbol of the Old Jedi Order. Rey puts her hand over this book. Luke says, "It's so much bigger." You get a shot of Luke standing near Rey while she does some lightsaber training on the cliff-side. There are some new vehicles, and when they crash on the surface they create some sort of a red dust. You see what looks like AT-AT walkers in the distance. You see Finn in some kind of Bacta Tank, recovering from his injuries he got in his lightsaber duel with Kylo Ren in The Force Awakens. Then BB-8 and Poe Dameron are running along some kind of hallway, and you see a battle going on and Poe's X-Wing blows up. You see the Millenium Falcon in a space battle. Rey is then running with her lightsaber. Then Kylo Ren is holding out his lightsaber. This confirms he has abandoned his mask. You can see his nasty scar. Luke is standing with R2-D2 in front of his burning Jedi Temple. Captain Phasma is seen walking among the ashes and fire. There is a big space battle, and you can see an A-Wing in it. Then the most chilling part of the trailer happens. You see Luke in a cave. he says these mysterious words: "It[s time for the Jedi to end." Then the Last Jedi text appears. I think that Luke meant he wanted the Jedi to end, so there is a new order which balances the force (not light or dark, the middle.) It was a good trailer, and I am excited for the movie! Happy Star Wars day! See you next time! BBBBBYYYYYYYYEEEEE!!! !